Each Monday during the NHL season, Rob Mixer takes a look at the biggest storylines from the hockey week that was. We need to talk about the Florida Panthers. And, probably unfair to them, but hot finishes tend to fuel unrealistic expectations or too much hype heading into the next season. I remember covering the Columbus Blue Jackets when they were way out of the race late in 2014-15 and went 15-1-1 down the stretch, ruining their chance at Connor McDavid or Jack Eichel while creating a false sense of hope moving forward, as well. They opened the next season 0-7-0 and Todd Richards was fired, leading to John Tortorella’s hiring. While I’m not trying to draw direct parallels between the two situations (and there’s no indication that Bob Boughner is on thin ice in Florida), it feels kind of similar to the 2018-19 Panthers. They finished last season 25-8-2 down the stretch, one point out of a playoff spot in the East. The Panthers had been an afterthought at the All-Star break. Now, Boughner thinks they’re struggling with high expectations. Expectations that were born from their strong finish. The Panthers have only one win in their first six games – which isn’t good enough on its own – though their lone win was a good one, a shootout victory over the defending Stanley Cup champions. The Cats next performance was dreadful and they became the “team that lost to the Red Wings.” Yes, Detroit’s 4-3 overtime victory on Saturday was its first win of the season, and it came at the expense of the Panthers. Should they panic? No, but it’s getting to be that time to right the ship. 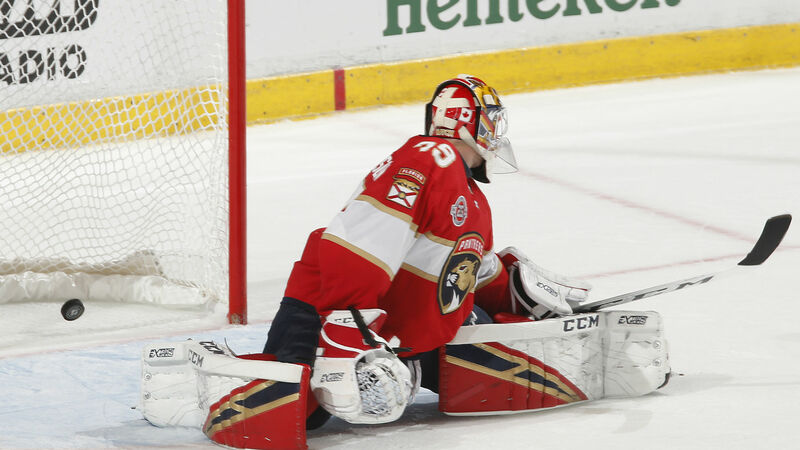 The Panthers have given up 25 goals in six games, they’re without Roberto Luongo and goaltending has become a problem, and they’ve yet to win at home. They’re in danger of falling too far off the pace in a competitive Atlantic Division, and with the vaunted U.S. Thanksgiving standings benchmark a month away, the Panthers desperately need to get a move on. There are too many good players in Florida for this not to work. The longest losing streak (to open a season) in Detroit Red Wings history ended Saturday at BB&T Center, and Gustav Nyquist’s overtime goal was more exhale than celebration. Take Dylan Larkin – he extended both arms to the sky, leaned his head back as if to say “finally!” after Nyquist beat Michael Hutchinson low to the stick side. And, of course, that means the Red Wings got to do something they hadn’t yet done in 2018-19. “Music in the locker room after the game, and some smiles,” Larkin explained. Both the Ottawa Senators and Montreal Canadiens are off to solid starts and within earshot of the playoff picture. For all of the weirdness, the offensive outbursts, and the general early-season unpredictability that we’ve seen so far, these two teams have turned the most heads – and, surprisingly, in a good way. Guy Boucher didn’t have the most enviable job entering the season. The Senators were one train wreck after another this summer, and GM Pierre Dorion came under heavy criticism for how he handled the Erik Karlsson situation. The end result was an underwhelming roster, one that virtually every pundit agreed would be among the NHL’s worst. It’s certainly possible that they’ll fall back and into the draft lottery discussion, but for now, the Senators are 4-2-1 and averaging four goals per game. Remember, scoring was a major question mark coming into the season. The reality is that it’s going to be next to impossible for Ottawa to make the playoffs in the Atlantic Division, yet they remain a surprise in the first month of 2018-19. The red-hot starts of Nathan MacKinnon and Mikko Rantanen have the Colorado Avalanche pushing the Nashville Predators atop the Central Division. Both players have at least a point in Colorado’s first eight games, which is a historic feat in its own right. Per NHL.com, MacKinnon and Rantanen are the 21st set of teammates in NHL history with season-opening points streaks of at least eight games. MacKinnon enters Monday’s game in Philadelphia with eight goals and six assists, while Rantanen has two goals and 12 assists, thus far. They’ve combined to power the Avalanche to a 5-1-2 mark, only two points out of the division lead.